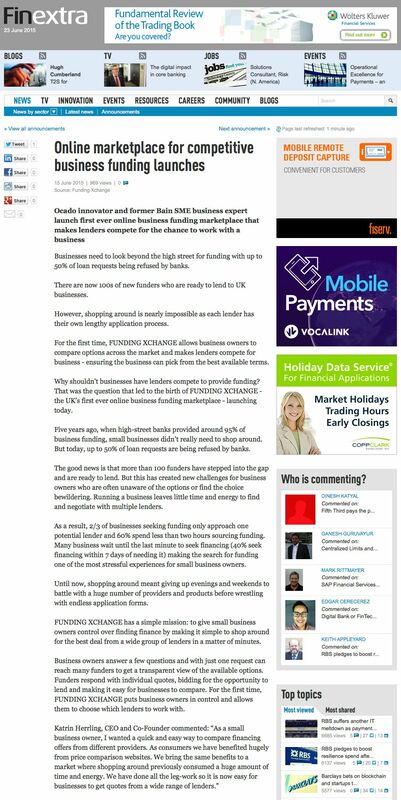 When we launched, Funding Xchange was featured in Finextra, the financial B2B publication. The article highlights all why Funding Xchange was created by co-founders, Katrin Herrling and Olivier Beau de Loménie. In the article, Katrin says: "As a small business owner, I wanted a quick and easy way to compare financing offers from different providers. As consumers we have benefited hugely from price comparison websites. We bring the same benefits to a market where shopping around previously consumed a huge amount of time and energy. We have done all the leg-work so it is now easy for businesses to get quotes from a wide range of lenders."